Now, a team at JQI led by postdoctoral researcher Seiji Sugawa and JQI Fellow Ian Spielman have succeeded in emulating a Yang monopole with an ultracold gas of rubidium atoms. The result, which provides another example of using cold quantum gases to simulate other areas of physics, was reported in the June 29 issue of Science. "This new result links together ideas born in high-energy physics—the Yang monopole—with concepts in condensed matter physics—topological phase transitions—and realizes them in the atomic physics laboratory," Spielman says. To detect the Yang monopoles in their quantum gas, Spielman, Sugawa and coworkers manipulated the internal compass needles that all atoms carry—a quantum property called spin—using radio waves and microwaves to rotate the needles in specific ways. By cycling the atoms among four different spin orientations, researchers were able to send the atoms on a journey through “spin space” and bring them back to where they started—very much like a traveler on the Earth’s surface taking a trip around the globe (but in four dimensions instead of the globe’s two). The team measured the orientation of the atoms’ spins after they completed their journey and compared the result to their initial orientations. They found that the atoms’ spins didn’t return to where they started, a discrepancy that can arise during a trip through curved space. In this case, the size and direction of the deflection matched predictions for the curvature created by a Yang monopole. 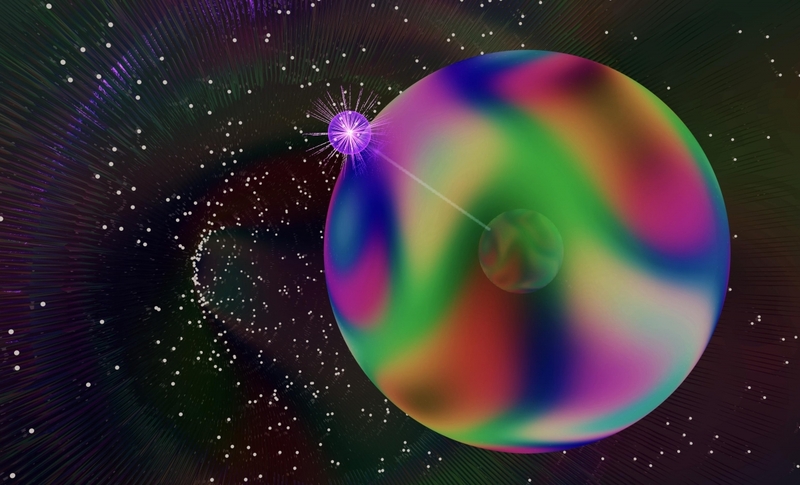 To test that the deflections were indeed due to the monopole and not another source, researchers sent the atoms on a different journey, one that attempted to avoid the space-bending singularity created by the monopole. On this new path, the atoms no longer felt an overall tug from the curvature, a strong indication that they had exited the monopole’s realm of influence. Turning the monopole’s effects on and off depends only on the big-picture shape of the paths that the atoms take and not on any small wiggles along the way—an indication that the effect is topological. The paths either enclose a monopole or they don’t, and this provides a topological feature that could lead to new types of quantum charge pumps, Spielman says.